The project that I am doing is called "Operation Patriotic Push-For Enduring Freedom". I am sending a copy of the song on cassette format to schools and making as many personal appearances as I can. 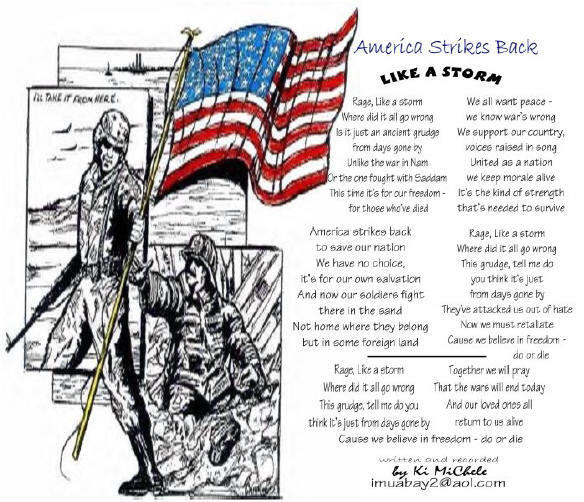 The purpose is to promote patriotism and to raise the collective consciousness of the community to the need for patriotism and unity for enduring freedom. I also want to deliver the message that there is an alternative way of regarding the issues of fighting and the war in which we are currently engaged. Since the terrorist attacks on the U.S., there has been a lot of controversy regarding the moral issues and divided philosophies about America Striking Back. It is a difficult decision to make. We know that war is wrong, but there are times when Wrong is Right. This song expresses an alternative philosophy that I think of as the Middle Way. It is an attitude between violence and pacifism. We try to avoid violence and we never start it, but if someone else does, there are times that we have no choice but to defend ourselves, friends, family, and anyone who is in trouble. We do not feel pride or satisfaction for having to fight, but by not fighting evil, one becomes part of it. We feel instead disgust and sadness at the necessity of it, but should not be ashamed of it either.